Presta's ReNuLite Headlight Restoration Kit restores like-new clarity to cloudy, scratched, oxidized and yellowed plastic lenses. 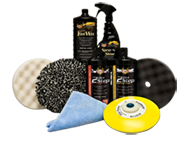 This Restoration Kit effectively removes fine scratches, surface contaminants, oxidation, cloudiness and yellowing, leaving plastics brilliantly clear, polished and protected against future discoloration. Works great on headlights, brake lights, light bars and more! Get the latest Presta news, tech tips and special offers delivered right to your email inbox! View & upload photos of the coolest cars, trucks motorcycles and boats! Get expert advice from the Presta Tech Professionals. Watch video tutorials.